YouTube stars Alissa Violet and Ricky “FaZe” Banks were ejected Saturday night from a Cleveland pub. FaZe ranted on his stream. Violet, selfying her way to hospital, sported a fat lip. The couple immediately went on an online offensive, identifying the Barley House and claiming to have been innocent victims of its bouncers. What happened next is all too predictable: their army of millions of social media fans formed an "unrelenting internet harassment campaign," issuing insults, death threats, some even driving hours to intimidate staff in person. 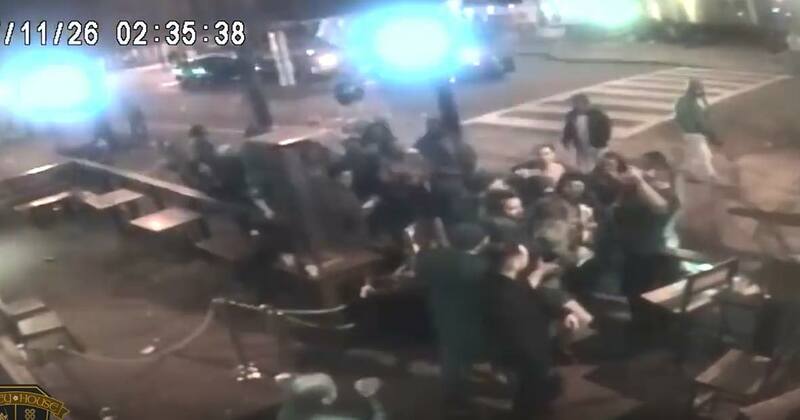 But the Barley House has the receipts, and, it turns out, the gumption to post them in public: security footage recorded that night that shows the pair instigated all the trouble, were ejected without harm, then got into a fight outside with other patrons. Banks even appears to throw a glass into the crowd. After a crazy few days of cyber bullying including death threats to our employees, our website being hacked, our social media channels forced to be privatized, and false online review efforts to punish our reputation, we finally get the opportunity to put the facts together of what really happened and clear our name of Ricky Banks' and Alissa Violet's accusations towards Barley House. It seems almost a caricature of the narcissistic, talentless YouTube star — the sort of inexplicable fame that turns everyone over the age of 18 into an out-of-touch curmudgeon. But what's interesting is that hardly anyone over the age of 18 even knows about these people. Neither the media nor mainstream America is watching the massive, invisible personality cults of YouTube form. It's inconceivable to us that children (let alone ourselves) would watch losers like Violet and Banks jabber on, every available hour they have. The rambling vanity of YouTube's angry alt-right nerds gives us a mistaken impression of the medium's power, especially given the obvious danger of their IRL brethren on the far right. But if this is what a pair of bullshitting numpties like Banks and Violet can summon, imagine what a person with genuine charisma and drive could do. Soon, a YouTuber is going to take an audience of millions places. The Fitness Marshall has over a million subscribers and over 150 videos on his channel. His paltry take after three years of work comes to about $20 a video after record labels and everyone else take their cuts.